Disney TV movies are that great meeting place for has-been actors and going-to-be actors. 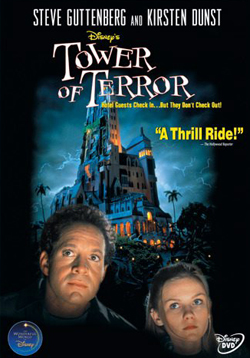 So that’s why Steve Guttenberg and Nia Peeples of Fame get the honor of starring with up and comer Kirsten Dunst in the 1997 flick Tower of Terror! Perhaps it’s time for Kirsten to appear in a remake so she can meet her replacement…? Although it takes place on Halloween, there isn’t a pumpkin in sight! Bummer. But there are plenty of ghosts and some witchcraft. Back on Halloween 1939 at this big tower hotel, there was a horrible elevator accident involving a little Shirley Temple-like actress and her family on the way to a dance. Now, Steve Guttenberg is a reporter trying to score a story to be reinstated on the newspaper run by his ex, Nia Peeples. Conveniently, an old lady comes to Steve and says she knows what really happened that night in 1939 because she was there. She’ll give him the story if he helps her free the ghosts in the abandoned tower hotel from a curse they are under. So Steve and Kirsten, who plays his niece, head to the hotel to check it out. After a couple of surprisingly creepy ghost spottings, including a headless dude with a cleaver, what’s not surprising is that Tower of Terror turns into a “cute” Disney movie with friendly ghosts. And one of the ghosts is John Franklin, better known as creepy little Isaac of Children of the Corn! Tower of Terror is no Hocus Pocus, lacks any Halloween spirit, and is probably more fun for the kiddies. Adults will guess the twist from the very beginning and there isn’t much knee-slapping humor to be found. Personally, I was hoping Nia would at least break out into her one almost hit, but alas…. This entry was posted in Movie Times & Television Schedules - Staying Entertained, The Evil of the Thriller - Everything Horror and tagged Disney’s Tower of Terror, ghosts. Bookmark the permalink.